A structural analysis report that provides technical justification for the waiver of certain FRA crashworthiness requirements, which highlights interesting differences between modern European and American approaches to rail vehicle crash safety. Big industry players like Alstom, Siemens and Bombardier (but curiously not Stadler?) all seem to have contributed to this effort. A compliance assessment that details which U.S. rail vehicle regulatory requirements will and will not apply to Caltrain's future EMU order. This document makes clear that even if the waiver is granted, there are so many unique U.S. requirements that buying an "off-the-shelf" European train is out of the question. A technical description of CBOSS, the new signaling and train control system that Caltrain is bravely attempting to develop. Interoperability with Union Pacific freight trains, a focus on soon-to-be-removed grade crossings, and a slew of don't-exist-yet features all promise to spice things up by "challenging the supplier to develop something new and to do it in a way that involves minimal impact to the Class 1 freight railroads that are collectively working to develop their PTC solution"... to put it mildly. As was opined here before, good luck with that. Grade crossing lists for Santa Clara and San Mateo counties, with safety improvements now underway. A hazard analysis that describes accident scenarios and their mitigation. A summary of infrastructure assets with assorted sundry facts about Caltrain (did you know this? Caltrain has 44 main track #20 turnouts, and 7,386 parking spaces. Oh, and a ten-gallon hat holds barely six pints). A listing of vertical and horizontal clearances at overpasses, tunnels, bridges, sheds and canopies. This contains an interesting tidbit: the contact wire height of the future overhead electrification, down to 21'1" in many places--less than a foot from the top of Plate H freight cars. This presumably implies that the wires will be de-energized at night for freight operations. Wire heights drop to less than 18' north of Bayshore, which may require gauntlet tracks for excess-height freight to reach the Port of San Francisco... one wonders what they have in mind, besides the obvious solution of forgetting the idea of Plate H freight service to the Port. For the technically inclined, this makes for some very interesting reading. The picture that emerges is that of a very limited and surgical waiver of a few requirements within a regulatory framework and development environment that remains firmly anchored to the world of freight trains. Sometimes, it's useful to step back and contemplate what we are attempting to build here on the peninsula. Might things not be simpler if Caltrain and the CHSRA invoked paragraph 8.3. (c) to build "a transportation system that is a significant change in the method of delivery of Commuter Service which would be incompatible with Freight Service on the Joint Facilities" ? I wonder if the delay in releasing the alternatives report from the CAHSRA for the peninsula was done so that this could be taken into account? Unlikely. Just because the comment period is closed means nothing for how long it will be before the waiver is granted. Awesome, it says the structural analysis was approved by "Dad". I didn't know my dad was working on this, awesome. This language comes from the Scoping Comments letter from Union Pacific (signed by Jerry Wilmoth), sent to the CHSRA February 23, 2009. Section 12, paragraph (i) states: "Union Pacific requires overhead clearance of 23 feet 6 inches, which is higher than the Authority contemplates for its electrical system." I assume that it is possible to have different cable heights for HSR and Caltrain's anticipated EMUs. I also assume dedicated tracks, with HSR on its own set and, ostensibly, Caltrain and UP on the other. So,it would be a matter of EMUs and UP freight compatibility on the same tracks. Will that be a problem? Recent NTSB comments regarding rail safety suggest requiring more stringent attention to adequate crumple zones on US tracks. That does not bode well for those, like Caltrain, seeking FRA waivers to mix European standard EMUs with US standard freights. Even scheduling separations may not be adequate safeguards. Current Caltrain and UP schedules are interleaved in the evening despite claims of time separations. What seemed simple conceptually, now becomes more complicated. The devil, as we know, is in the details. "Recent NTSB comments regarding rail safety suggest requiring more stringent attention to adequate crumple zones on US tracks." NTSB recommendations are pure nonsense. There is no possible way to engineer railcars to survive collision at speeds being planned, no matter how gigantic the crumple zone. NTSB is only an advisory body. Thus, they are completely free to make 'safety' recommendations no matter how expensive or impractical. @Martin: the heights in that document are what's available under bridges. There's nothing anyone can do to make them higher, short of raising the bridges or trenching the tracks, and I doubt they will go to such lengths to accommodate a type of freight traffic (excess height freight cars) that has never operated on the peninsula to date. FYI, the CHSRA tentatively plans 18'9" wire height for shared-use 125 mph corridors, which would work just fine with the regular-height freight trains that currently operate on the peninsula. So, the height that UPRR is requesting would support a new type of freight traffic that has never operated on the peninsula north of Santa Clara. They don't just want their current capability preserved, they want more. Probably because this will be paid for with OPM (other people's money). You've got the right idea, though, that freight requirements (clearances, platforms, superelevation, PTC, etc.) are dragging Caltrain down into a netherworld of HSR incompatibility, and that the incredible synergy between Caltrain and HSR that might have been possible to deliver outstanding commuter service is likely going to waste. There's certainly a lack of vision and proportion, and an irrational fear of being dragged before the STB by freight interests. As a friend put it, if push came to shove, Nancy Pelosi would knock some sense into the STB. @DrunkEngineer: your car's crumple zones won't work at 75 mph either. Is that a reason not to have them? "@DrunkEngineer: your car's crumple zones won't work at 75 mph either. Is that a reason not to have them?" 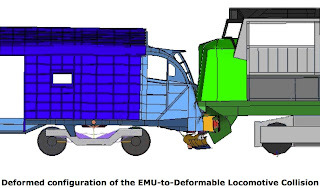 "European crashworthiness requirements yield designs that are less rigid than North American designs, relying on crash energy management (CEM) features to augment the crashworthiness of the rigid passenger compartment...the primary location for energy absorption is in front of the cab...Energy absorbing structures are in front of the operator’s seat...The second location for energy absorption is at the interface between each carbody." Ironically, as the structural analysis details, FRA compliant equipment failed to pass the European crash test (EN15227 - 70 mph collision with 33,100 lb truck) because of its limited crush zones. Martin's comment actually strengthens the argument in favor of European equipment. * ... Big industry players like Alstom, Siemens and Bombardier (but curiously not Stadler?) all seem to have contributed to this effort. Which companies have North American subsidiaries, can profit over technically and economically superior competition using "Buy American" regulation, and the support the ecosystem of second-, third- and fourth-rate American passenger rail consultants? * ... This document makes clear that even if the waiver is granted, there are so many unique U.S. requirements that buying an "off-the-shelf" European train is out of the question. Which document was written by second-, third- and fourth-rate American passenger rail consultants and who is paid to facilitate the jumping through of the hoops of unique U.S. requirements? Why, second-, third- and fourth-rate American passenger rail consultants! Which sparkly new and unique signaling system was required and designed by on say-so and expertise of second-, third- and fourth-rate American passenger rail consultants and who will be end up pocketing something half a billion first-rate American dollars? Why, second-, third- and fourth-rate American passenger rail consultants! * A hazard analysis that describes accident scenarios and their mitigation. Funnily there does not seem to be any mention of what has proven, in unfortunate real world experience (Eschede, Glendale, Selby, etc), to be real world contributor to hazards, which non-second-rate authorities prohibit where-ever possible: the positioning of turnouts (i.e. derailment severity enhancement devices) near grade crossings, bridges, and tunnels. Perhaps this is because Caltrain really likes to place its news crossovers near its nice collection of grade crossings? * ... This presumably implies that the wires will be de-energized at night for freight operations. Wire heights drop to less than 18' north of Bayshore, which may require gauntlet tracks for excess-height freight to reach the Port of San Francisco... one wonders what they have in mind, besides the obvious solution of forgetting the idea of Plate H freight service to the Port. * ....Might things not be simpler if Caltrain and the CHSRA invoked paragraph 8.3. (c) to build "a transportation system that is a significant change in the method of delivery of Commuter Service which would be incompatible with Freight Service on the Joint Facilities"? Declare that so many HSR trains will run between SJ and SF that a separate HSR line and separate HSR stations are required. The construction industry profitability should be obvious, right? Declare that freight is so vital that Caltrain must be designed around freight regulations, freight standards, and freight operating rules. Caltrain's unique signal system will be designed around freight. Caltrain's unique platforms will be designed around freight, and will be incompatible with HSR. Caltrain's unique trains will be designed around FRA freight. Caltrain's electrification system will be designed around freight. Caltrain's structure clearances will be based around freight --- not just any freight, but super-sized, extra-tall, extra-hight freight. Boeing is about to open a 747 manufacturing plant at the Port of San Francisco, and partially assembled planes need to be shipped in via San Jose, 24 hours a day. Freight will then be abandoned, after all this study, design, development, procurement, construction and lucrative engineering change order process has played out. Nevertheless, HSR is to require a Caltrain-compatible. freight-compatible, US-only signal system that just so happens to be available only from the ecosystem of second-, third- and fourth-rate American passenger rail consultants and Buy American suppliers. It just works out that way sometimes. Caltrain will then be abandoned, because it will have become a marginal little all local stops shuttle line between the BART station in Millbrae and the BART station in Santa Clara. Passengers will demand fare, platform and access integration with the BART system. Bridge the gap! Rail around the Bay! Smart people seem to agree that this is a likely outcome. It's certainly a de$$$$$$$$$irable one! Summary: I see big profits at every step. It's almost as if every step had something to do with having a big expense, somehow or other. I'm working out how to Get Involved. And not just by attending public meetings and writing my democratically elected representatives. My name isn't "HNTB" or "Bechtel" or "LTK" or "PBQD" or "Halliburton" or "Brown and Root", but I'm sure there will br crumbs left over even for little small businessman me, from now until well past retirement. All aboard! The train is leaving! Summary: I see big profits at every step. What about the step where they moved towards ERTMS instead of encouraging this CBOSS nonsense? How could they make such a huge mistake and leave so much money on the table? There was in interesting blurb in one of those documents about operations. It seems as though Caltrain would retain the MP36's and Bombardier equipment for baby bullet service while the EMU's would be reserved for local and limited service or some combination of the two. That's because the MP36s and Bombardier coaches have many years of useful life left in them, and Caltrain can't afford to replace its whole fleet at once. Electric trains accelerate and decelerate much faster than diesel trains, but this is obviously less of an advantage for the baby bullets which don't need to accelerate nearly as often as a local train. So the idea is to introduce the EMUs on services where their performance advantages will yield the most bang for the buck. There's a thriving market in used locomotives and cars. When are they due for a major overhaul. When is the line going to fully electrified? Actually it makes sense for them to use their newer diesel equipment on the Gilroy-SJ route, where no electrification is planned. The line is going to be electrified all the way to Anaheim. CalTrain, as far as I understand, won't be piggybacking on HSR's electrification infrastructure south of San José. As far as we can tell, it's still going to run on the UPRR tracks. "CalTrain, as far as I understand, won't be piggybacking on HSR's electrification infrastructure south of San Jose. As far as we can tell, it's still going to run on the UPRR tracks." The San Jose presentations seem to indicate this. Caltrain shares track with UP but not with HSR! Cretins! Bonus profiteering: instead of one UPRR track (all that's needed for 3 freight trains a day) and two non-FRA tracks (plenty for HSR needs together with just a couple Caltrains every hour) they're demanding TWO UPRR/Caltrain tracks and TWO HSR/nothingelse tracks. Extra cost. Extra construction. Extra property. Win. Win. Win. Q: Are the idiots at Caltrain completely out of their minds? Are they the least competent engineers that it was possible to locate anywhere, after the most extensive and thorough program of barrel bottom scraping? Anon, if you're going to go name-calling, have the spine to sign your name. Next time such comments will be nuked. Anon, if you think Caltrain's bad, you really don't want to know what goes on at Metrolink and the LACMTA.